Here it is, our new tee for Haiti. 100% of the profits. Seriously. And you might have noticed, we redesigned it. What’s that they say about woman’s prerogative? Actually, we ran into some fatal printing issues with our original design that made the production of that tee impossible. So we went back to the drawing board. And we are so excited to see what God is going to do with this effort. And we can’t wait to release this bad boy on Friday to start raising funds for Haiti. So, what else could we do? We’re celebrating with a giveaway. Find out how to enter on the Wild Olive blog. Wow! Love that t-shirt and am thrilled you are giving the profits to Haiti. Way to go! Awesome! Generous! What if you don't have a blog and are just a non-savvy technot follower! Any way to get in on the deal, like for each one I buy, I get an entry? Doesn't matter, you gals, are awesome! I am the adoptive mom of the child featured on joe and jenn's site. My daughter is STILL in HAITI, but I am getting so close to bringing her HOME. It has been such a long month. She is now SICK, and I don't really know what that means, a cold or really, really sick. Sickness is now claiming the lives of the little ones. Please pray, she just turned 11 months on Sunday. Can't wait to buy the t-shirt. I have become a COMPLETE SUCKER for these tees! My girls have them now too and I kid you not Stefanie…someone ALWAYS asks where we get them…EVERY time we wear them. They are wonderful. 100% of the profits? GOOD FOR YOU!!! Got it up and going on my blog!! : ) Wish more people visited so that you could get many more donations…. LOVE IT! You guys are awesome! 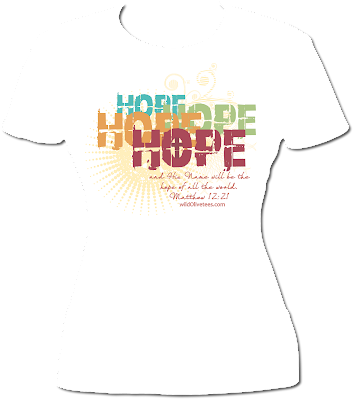 I JUST posted a picture, a link and DETAILS about the HOPE tee on my Facebook! SO excited for y’all! And THRILLED to be a tiny part of getting the word out!! Went there, Did that. Gonna order one anyway just in case I don't win…. Hope the sickness has passed right over you and Asher. Is it ever creepy to you to think of people you don't know talking to you and/or about you as if you were next door neighbors?? Here's to hoping I'm not creeping you out…. Congrats on the release of this beautiful tee!!! Thanks for all you do!! !